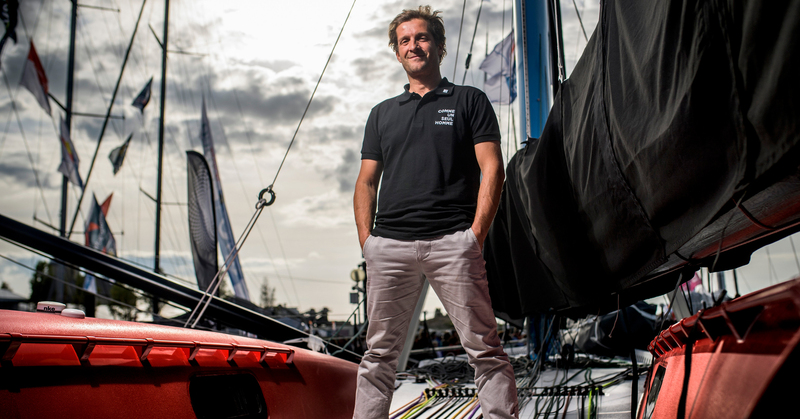 This departure for the Vendée Globe race was a great leap into the unknown. It’s the craziest thing of my life. Before this, I went around the world aboard the Kifouine, a very small 8-meter long boat on which we stayed for three years with three friends, and embarked young disabled people at each port of call. It wasn’t reasonable, we took enormous risks, but it was fifteen years ago. I realize today I am attempting something even crazier. I ask myself on a regular basis if I am ready for this. At the time I am writing this, it is pitch black, I am in my cave in front of the nav table, the wind roars and water keeps shipping over the bow. It’s exhilarating but requires a discipline of steel. I remember two images from this departure. The first is when Sam (Goodchild) left the boat last, six minutes before departure. I realized that it was I who was leaving, and nobody else! It was something crazy, super impressive with all these boats around me. There were so many waves created by the accompanying boats that the sea was foaming! We had prepared this moment with Sam in order not to take any risks and I am happy about this departure. I wasn’t at the forefront but I was a part of it and I didn’t break anything. It’s a first thing I am proud of. 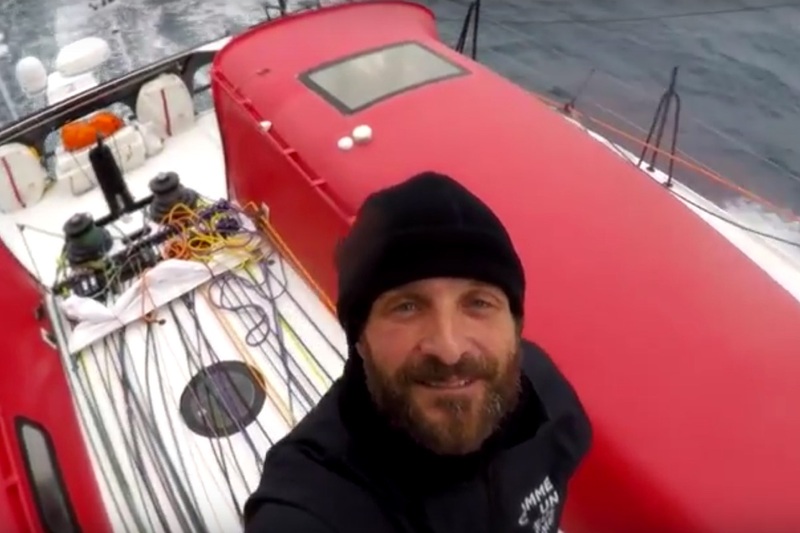 The second image is the one of the boat of the technical team turning around and sailing back to the Sables d’Olonne one hour after departure. There I found myself completely alone with this round-the-world race before my bows and gave me intense vertigo. It lasted around 24-48h and I’m not sure I even ever got out of it. I am still in apnea. Once in a while, I get massive doubts, but the only way to make it is to be humble and serious at the same time. I am still discovering the boat; the conditions aren’t easy with the wind that fluctuates a lot. “Innovating means taking two steps in the dark”. Attempting new things has always been the motor of my life, up until now I’ve still always managed to make it. Thankfully, I was properly surrounded. I like to transform the impossible into possible and it’s by sharing my experience on diversity that I made it up to here. I chose this life outside of comfort, of security, because for me, happiness means the unknown. I did it because it’s my lifestyle. It requires fierce courage and a state of mind. I’ve always said that innovating means taking two steps in the dark. 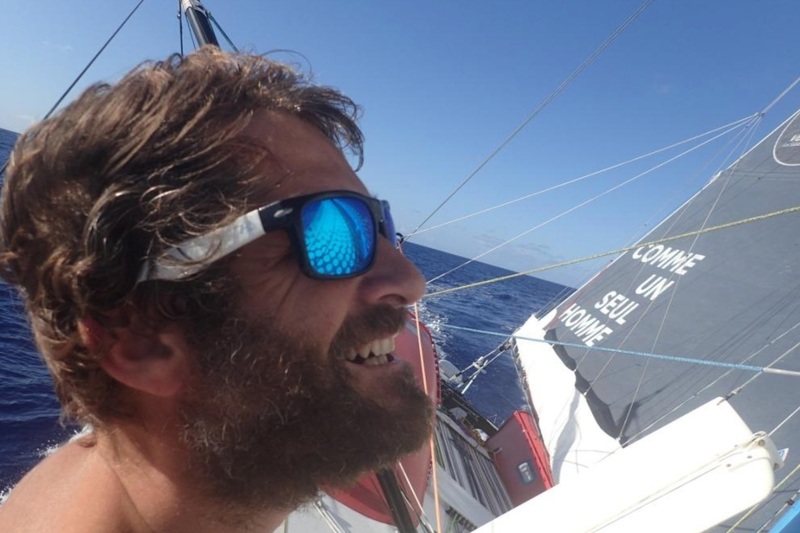 On this Vendée Globe, I only took the first step and I still can’t see the light turning on! Of course, I watch the position of the boats around me but I don’t feel affected by the competition. Even if I give my best to go as fast as I can, I am living an adventure before all. Maybe the most beautiful adventure. Op-Ed: What is it all for?